Soldier #1: I'd like a pan-fried noodle! Chien Po: Ooh, ooh. Sweet and pungent shrimp. Soldier #2: Moo goo gai pan! Ling: Looks like our new friend slept in this morning. Why, hello, Ping. Are ya hungry? Yao: Yeah, 'cause I owe you a knuckle sandwich. Chi Fu: So it's true! I knew there was something wrong with you! A woman! Treacherous snake! 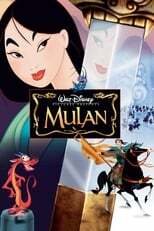 Mulan: My name is Mulan. I did it to save my father. Mulan: I didn't mean for it to go this far. Emperor: The flower that blooms in adversity is the most rare and beautiful flower of all. Emperor: You don't find a girl like that every dynasty! Fa Li: [looks at Mulan's wrist] Mulan, what's this? Mulan: [snatches wrist away] Um... notes, in case I forget something. Fa Li: You must go after her; she could be killed! Female Ancestor #1: I knew it! I knew it! That Mulan was a troublemaker from the start! Male Ancestor #1: Don't look at me, She gets it from your side of the family. Female Ancestor #2: She's just trying to help her father! Male Ancestor #2: [holding a counter in his hand] But if she's discovered, Fa Zhou will be forever shamed! Dishonour will come to the family! Traditional values will disintegrate! Male Ancestor #3: Not to mention they'll lose the farm. Female Ancestor #1: My children never caused such trouble. They all became acupuncturists! Male Ancestor #1: Well, we can't all be acupuncturists. Female Ancestor #3: No! Your great-granddaughter had to be a cross-dresser! Grandmother: Great, she brought home a sword. If you ask me, she should have brought home a man. Shang: [walks in] Excuse me, does Fa Mulan live here? Grandmother: [aside] Ooh, sign me up for the next war! Great Ancestor: Great Stone Dragon, have you awoken yet? Mushu: (holding the stone head) I am the Great Stone Dragon! Good morning! I will go and fetch Mulan! Did-did I mention I was the Great Stone Dragon? Great Ancestor: We must send the most powerful of them all. Mushu: OK, OK, I get the gist, I'll go. Great Ancestor: You had your chance to protect the Fa family. Female Ancestor: Your misguidance led Fa Deng to disaster. Fa Deng (holding his severed head): Yeah, thanks a lot. Mushu: And your point is? Great Ancestor: The point is, we will be sending a real dragon to retrieve Mulan. Mushu: Wha-What! I am a real dragon! Great Ancestor: You are not worthy of this spot! Now awaken the Great Stone Dragon!